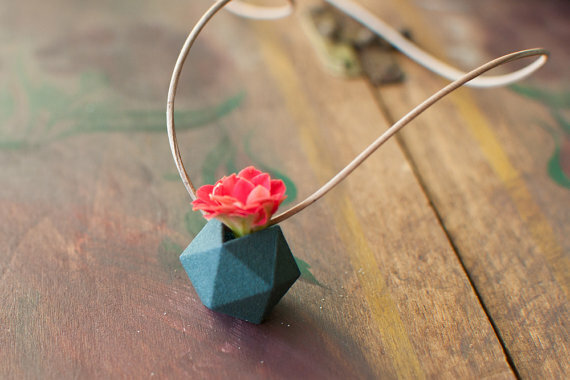 I've featured jewelry designers before who use real plants and those who create beautiful containers for picked flowers. 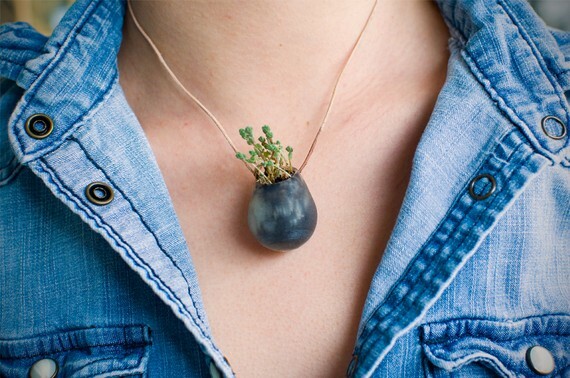 A wonderful new find is designer Colleen Jordan's tiny vase jewelry in her Etsy store appropriately called Wearable Planter - Jewelry for Green Thumbs! 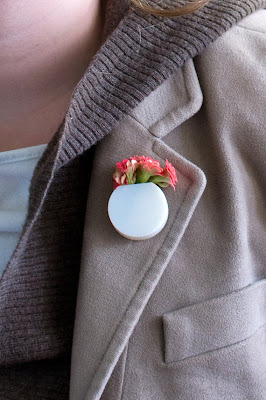 She first designs all her wearable planters using CAD software. They are then 3D printed using acrylic polymer and hand dyed and sealed. Colleen explains, "In the 3D printing process, the machine takes the file and organizes it into slices from the modeled form. Layer upon layer of soft acrylic plastic is built up and a laser passes by to cure the plastic into its final form." Colleen came up with the idea "... to prove that something beautiful worth passing down to your children could be made out of plastic." Succulents that have rooted, mosses or picked flowers are best. She does provide instructions on how to add plants because these are not shipped with the planters! Colleen's designs are so cool, she was a featured designer on Etsy back in 2011. These are just so adorable! Great as jewelry and garden/flower lovers as well. Just had to pin and facebook this. Love them. These are really cute. Don't think I would wear a planter, but I could hang them all around the house (-; cause there sooo cute! Green thumb over here! So funny, those wearbale planters. How darling and so totally different. My favorite is the white vessel, photographed against the rustic texture of the tree bark. I do wonder if she actually owns one of these machines (that uses a CAD program to create a 3D replica out of plastic) or if she simply has access to one. I have seen these machines demonstrated on TV. They made some incredible things, such as instant tools, replicas of human skulls, and small, prototype objects such as new, innovative kitchen gadgets. On one program they predicted that, someday, a similar machine could be used to create artificial hearts. I could only imagine that one would be very expensive to actually purchase but maybe there are places around that have these machine and that allow one to use them to duplicate their design items - just like there are places with Xerox and copying machines that one can use. Amazing! And cute as a proverbial button!